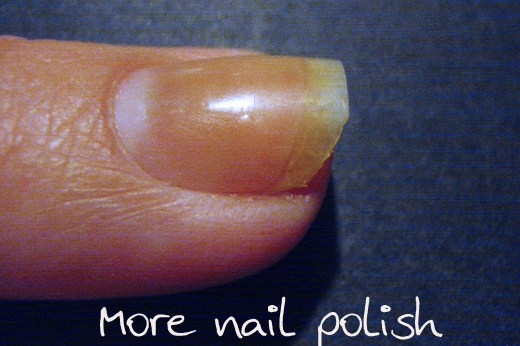 Today I thought I would show you how I fix broken corners to my nails. I like a square shape to my nails, which mean that every now and then a corner breaks off on of my nails. 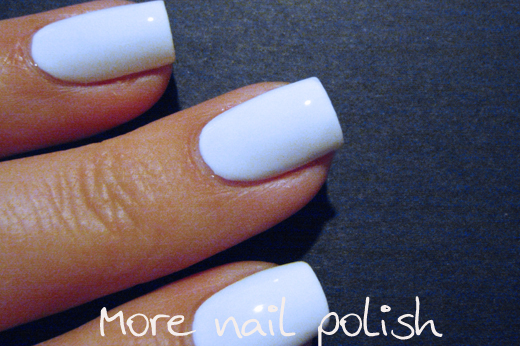 Rather than rounding them all off, I create a fake bit of nail using soft soak off gel polish - specifically Gelicious. I apologize for the yellowness of my fingers and nails in these photos. My nails are stained, but not as much as these photos would make out. They were taken at night under a warm white light, and I couldn't adjust the white balance enough to make them look better. But who cares about the colour, lets just look at the process. I fold up a piece of aluminum foil so it's four layers thick. I then curl it around a pencil to give it a nice curve and use scissors to cut the bottom edge so it can push in close under the free edge of the nail. I use a piece of sticky tape to hold it in place. This creates a nice bit of form work for the gel polish. 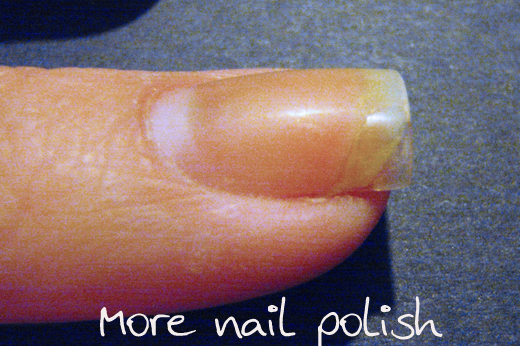 I then put a blob of clear gel polish so that it covers the corner of my nail and extends out over the piece of foil. Then I cure it under the LED UV lamp. Next I use tweezers to peel the foil off from under the gel polish. 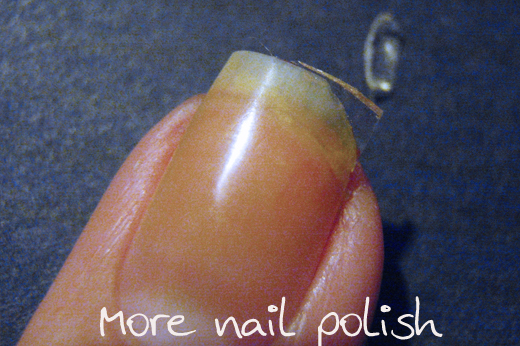 I use nail scissors to cut the two edges of the gel enhancement. I then file both the tip and the side until it's flush with my real nail. 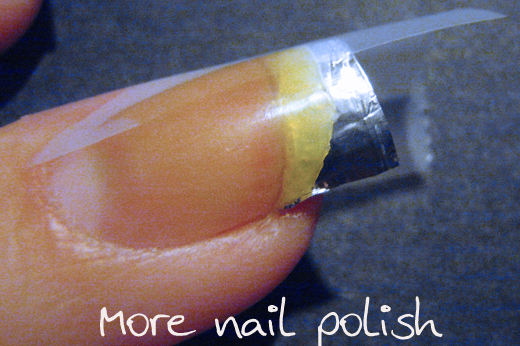 I usually do a light buff on the top of the gel to ensure it's level with the top of my nail. I'm always very careful as it gets down to the real nail as I don't like to buff that very much. 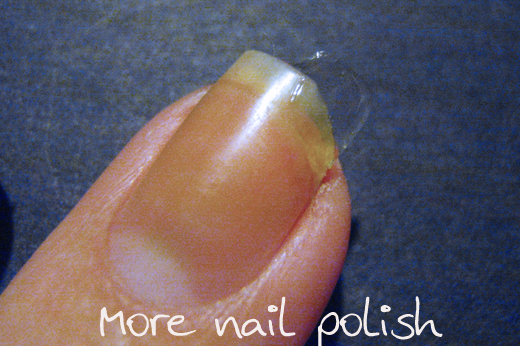 I like that the end result is about the same thickness as my natural nail, plus it has a bit of flexibility, so it doesn't break off too easily. Once you put a layer of polish on, you can't even see the patch. A gel corner patch usually only last me two or three days, but as I'm changing my polish daily it isn't a problem to redo the patch quickly when it needs it. I only takes me about 5 minutes to do it. While I'm talking about Gelicious polishes I thought I would show you some swatches of their two latest colours - and yes, I have the gel corner patch on in these photos. 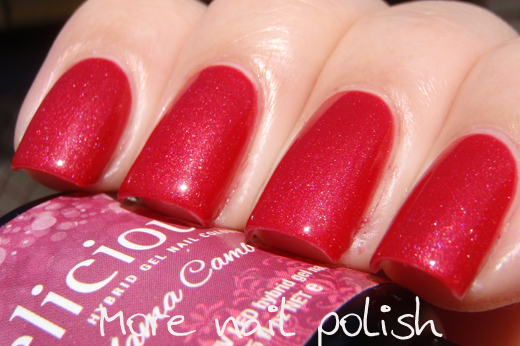 Both these polishes were released to coincide with the birth of the Royal Baby, Prince George. Breath of Fresh Heir is a pale frosted pink that applied beautifully. The high shimmer base does mean that some brush strokes will appear, but they are not as obvious in real life compared to my close up photos. Pigmentation was great and this was two coats of Breath of Fresh Heir with Ultra Glaze Top Coat. 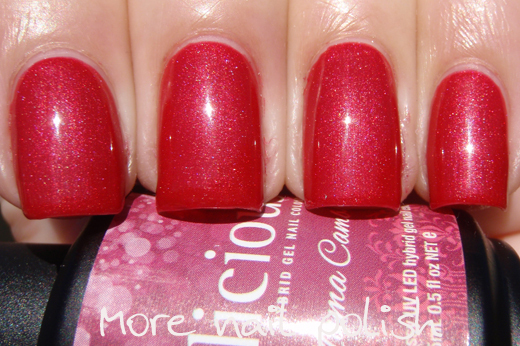 Hot Mama Cambridge - this one jumps between looking raspberry pink to looking tomato red. It has a pretty shimmer that isn't streaky and the formula was perfect to apply. This was two coats of Hot Mama Cambridge topped with Ultra Glaze Top Coat. 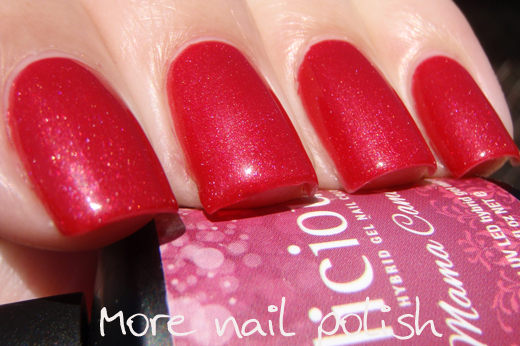 If you jump on over to the Gelicious site, you will see that I've been a busy little blogger and have now finished swatching the entire Gelicious collection of colours. It's taken me about six months to do them all, which is pretty much slower than a sloth, but I'm excited to have been able to swatch all their colours so shoppers can now really see what they are getting with real swatches. Thanks for the instruction. That will be really useful! Sweet idea, I wouldn't have thought of this, thanks! What a great idea! I used to do a repair with acrylic powder and a strip of teabag when I didn't want to reshape, but this looks so much easier and neater! That is such a good idea! Thanks for sharing Cathy! Amazing, what a good idea! Thanks for this tutorial. And thanks for the swatching, great effort. I do something similar with a piece of silk wrap and ASP lightless gel. I never thought to use the foil though to help shape it. I need to try that next time! Hmmm I might have to look into this! I recently converted to a rounder shape because I was sick of losing corners all the time! Ok, so when swatching the Gelicious collection I actually ended up using a peel off base coat (ie PVA glue) That way I can swatch multiple polishes in a day and not have to soak off every application. I only discovered this about 2/3rds of the way through, and that speed me up dramatically. Prior to that I was doing a few a week. When wearing gelicious, I usually only get about 3-4 days out of it. Not because it peels off, but because I'm changing my polish everyday, all the remover (even non-acetone) softens the gel and starts to make it bubble in the middle of the nail. My mum uses Gelicious all the time. She gets 7 days out of a mani easily, usually up to 10 days, but then she wants to change colour. This is so cool! I love nifty little things like this :) Great job! Awesome!! Thanks for posting about it, I was trying to visualise this and failing ;) I'm sure this will come in handy! Also I hold you entirely responsible for my renewed interest in SOGs and Gelicious in particular.